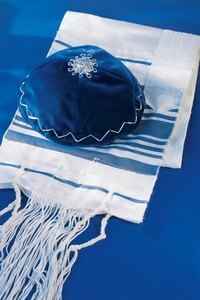 A Jewish prayer shawl is also known as a "tallit" or "tallis" in Hebrew. Jewish prayer shawls frequently exhibit navy or black stripe patterns, however, there are actually very few religious requirements regarding the actual design of the shawl itself. This crochet Jewish prayer shawl pattern makes a solid-colored shawl, however, you may add stripes if you desire. This pattern is best-suited for the experienced crocheter. Practice working basic crochet stitches, such as chain and double crochet, before beginning this pattern. Chain 54 stitches, or to the desired width of the shawl. Chain one stitch, then single crochet in each of the stitches across to the end of the row. Chain three stitches. Double crochet stitch in each single crochet stitch across the row. Repeat this row two more times. Chain one and single crochet stitch across the row. Chain three. Double crochet stitch for three rows. Single crochet for one row, then double crochet stitch for three rows. Repeat this pattern until you have the desired length of shawl. End with a row of single crochet stitches. Jewish prayer shawls can vary considerably in size depending on the style you are making and the size of the person. When worn in shawl style, sizing can range from 10 inches by 45 inches to 27 inches by 81 inches.